Since starting this blog in 2012, I have had a solid friend pool who have been very supportive of my crazy food quests (thanks guys!). But recently I have been thinking about engaging new palates and fresh perspectives, and to experiment with opening up my food quests to my social media followers. So I asked Twitter if there were any aspiring food questers who have the stomach capacity and dedication to insanely devote a day of their lives to sampling every platter of nachos on Spring Garden Road. 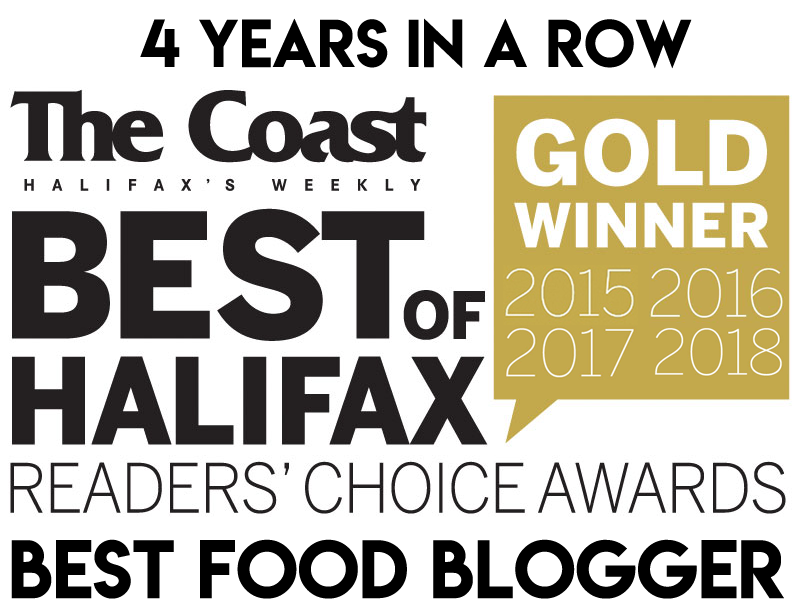 I enlisted from Twitter: Michael Dinn (@michaeldinn) of donair.org, Ben Jeddrie (@zyblonius), Laurie Burns (@lauriecburns), Denton Froese (@Labville), Vanessa Nickerson (@Prince_Lir), Richard (@mrdickmeadows), Jenn, and the Halifax Wingman (@HalifaxWingman)! Michael Dinn requested a category for “Quality of Sour Cream” but I didn’t humour him. Instead, he basically demonstrated over the course of the nacho crawl that he can distinguish between different brands of sour cream. Meanwhile, I realized that I didn’t have a precise category for “Quality of Toppings” – but this will be reflected in the scores and discussed at length. There was also a “Booze-O-Meter” (Vanessa’s idea!) on the scoring sheets so that participants could keep track of their beverage consumption. We had a fine mix of non-drinkers and heavy drinkers, so I believe the results are fairly reliable. *restaurants are listed in the order we visited them. For final results, scroll to the bottom. Despite rebranding, The Arms has kept their famous “Twice Fried Nachos” on the menu. They are $13 and the menu does not mention any carnivorous add-ons. We were a little confused about what “twice fried” meant, and it turns out it refers to the process of double layering and twice-baking. Perhaps “Twice Baked Nachos” would be more accurate. The group would have liked to see more cheese, but we were all impressed by the flavour imparted by the house-pickled banana peppers. Opinions differed on the tri-coloured nacho chips. These are aesthetically pleasing, but tend to be rather neutral in flavour owing to a lack of salt. It is a matter of personal opinion. For $13 this is a good portion size, and the platter scored first place in the category of “Perceived Value”. This platter looks cheesy and chunky, but as Michael Dinn notes, this is a “6 dressed up as a 9”. The large chicken chunks were that same wet chicken that I complained about when I wrote about the Pub Club. The beef was entirely unseasoned and tasted like boiled beef. Neither protein is worth the additional $3.50, which brings up the price to a whopping $18 ($19.50 with guac)! 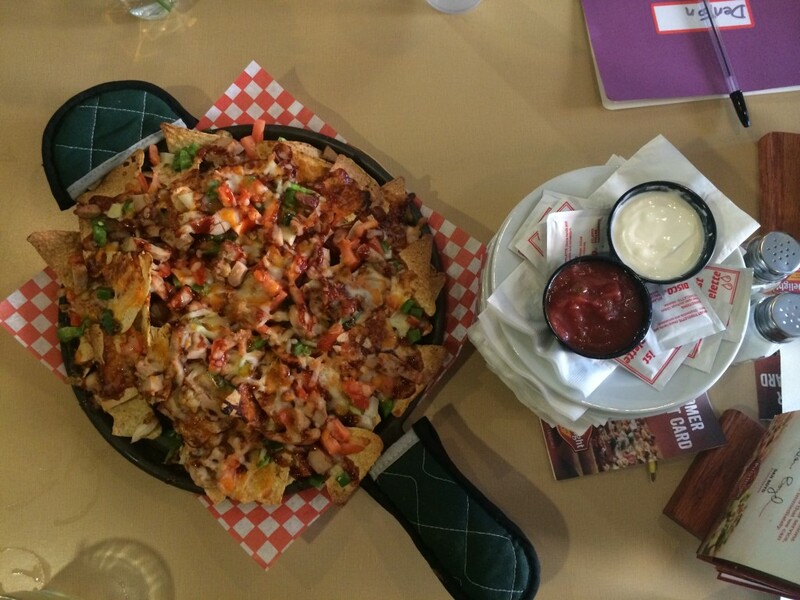 Pizza Delight’s nachos come in a 9″ and a 12″ skillet, and are drizzled with BBQ sauce. I’m not the biggest fan of BBQ sauce, but it wasn’t the BBQ sauce that would make or break these nachos. It was the poor layering and cheese coverage. There was a pile of naked chips piled beneath the illusion of cheesy wealth. With that said, the chips themselves scored the top mark! They were a golden blonde, toasty and warm. 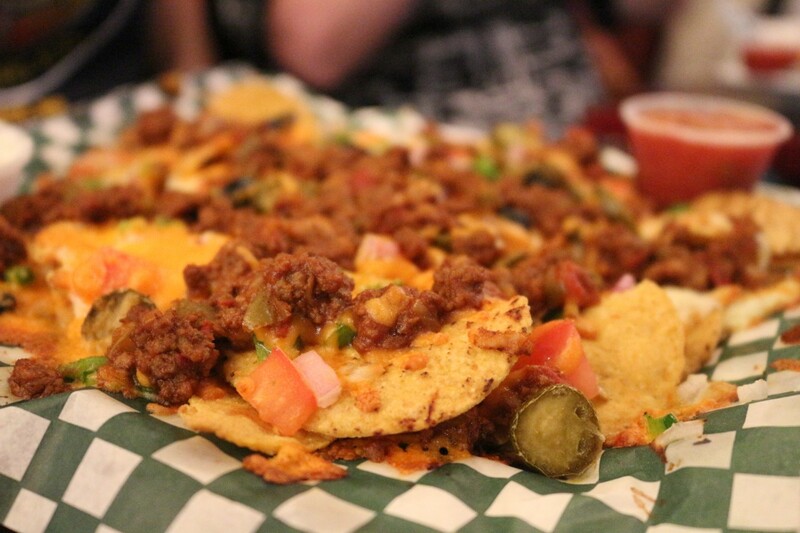 Vanessa noted that the nachos “smell/taste like everything else at Pizza Delight”. At $15.99 for a large nachos with chicken, the consensus was that the buffet is a much better value. 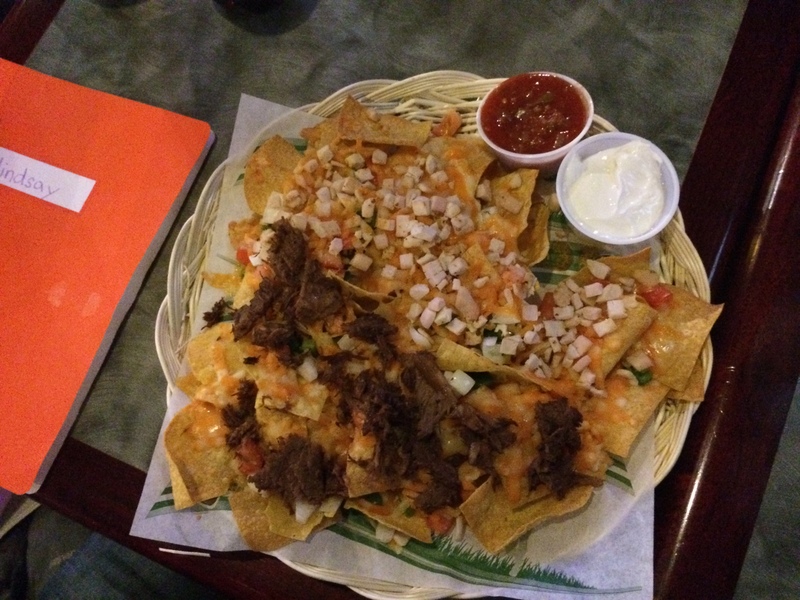 The Fickle Frog offers two types of nachos: “Tropical” (i.e. with pineapple), and “Classic”. You have the option of ordering a small or a large, so we ordered two smalls and put chicken on the Tropical nachos and beef on the classic. Makes sense. This was our first encounter with the notorious round nacho chips – disliked by many, but preferred by several questers for their saltiness and sturdiness. Since we ordered smalls, it was hard to judge the layering. There could have been more cheese, and we would have appreciated sauce vessels that we could actually dunk our chips in… but otherwise this was a pleasant surprise. “The big surprise so far!”, wrote Denton, “Combined with the thunder mugs, it makes for a good pub experience”. Michael was not a fan of the “Sobeys” salsa and thin, bland sour cream. I think the general consensus was that these nachos are a good value, if not particularly memorable. “Looks good on paper,” Ben commented, “…but somehow the final product was underwhelming”. The main problem was that the cheese was not melted enough and the nachos were lukewarm. These nachos had obviously not spent enough time in the oven. The toppings were “even and populous”, as Richard observed, and the beef was better than at the Moustache, but not quite as flavourful as at the Fickle Frog. “Hey guys,” I interrupted, “This is real chicken” – and it was, indeed, the first time we were served chicken that appeared to be from an actual bird… even if it was a little dry. For $10, the gang still considered this to be a good deal. That is… if you enjoy the Oasis atmosphere. Yes siree! The nachos at Bubba Ray’s came with this lovely pulled/stewed(?) beef that we just adored. The small diced chicken contributed to a good flavour distribution, if not an aesthetic appeal. This was the only place that did not charge us double for having half/half meats, so I give Bubba Ray’s some props for that. However, the portion was quite small for the price. It was certainly not “Mega” and actually quite average. 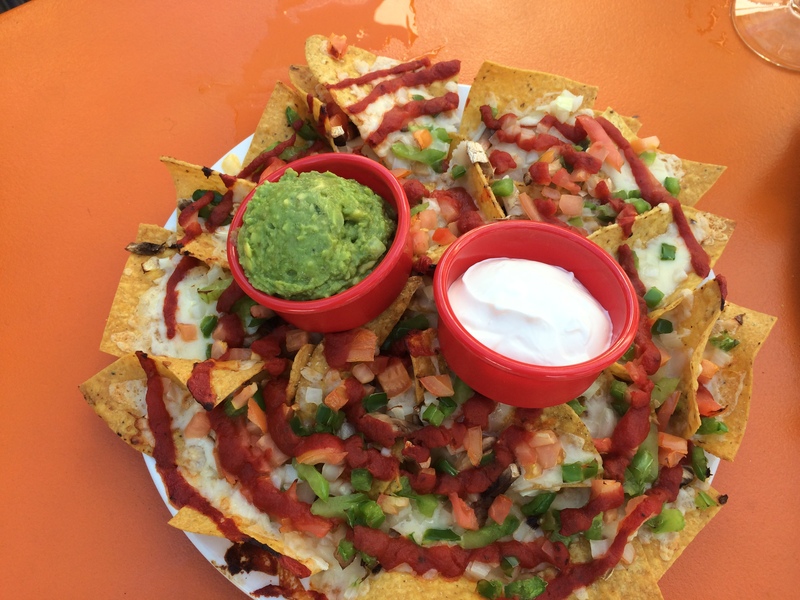 Nachos are a specialty at Mexi Cali’s Rosa’s. 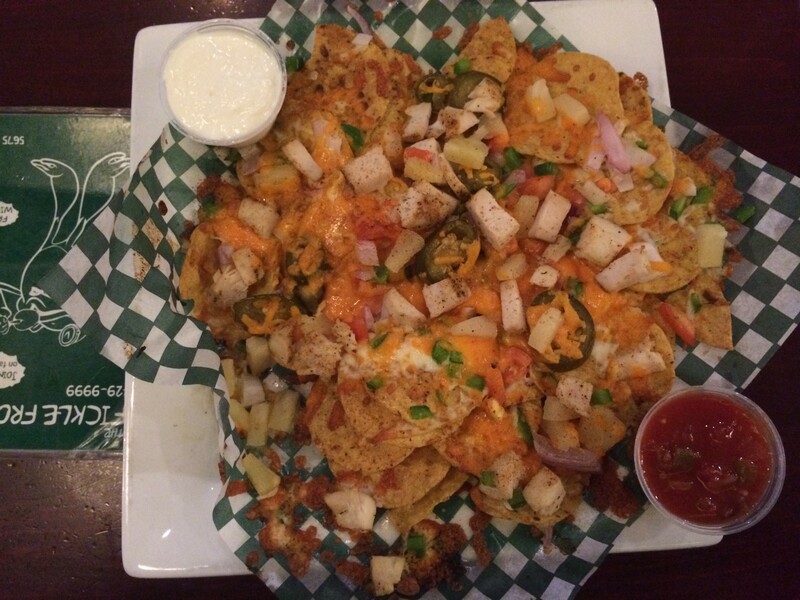 There are 6 signature varieties from the spartan “Mexicali Nachos” to the elaborate “Chicken Wing Nachos”. These are small single-layer platters, so we ordered two varieties to get a proper sampling. 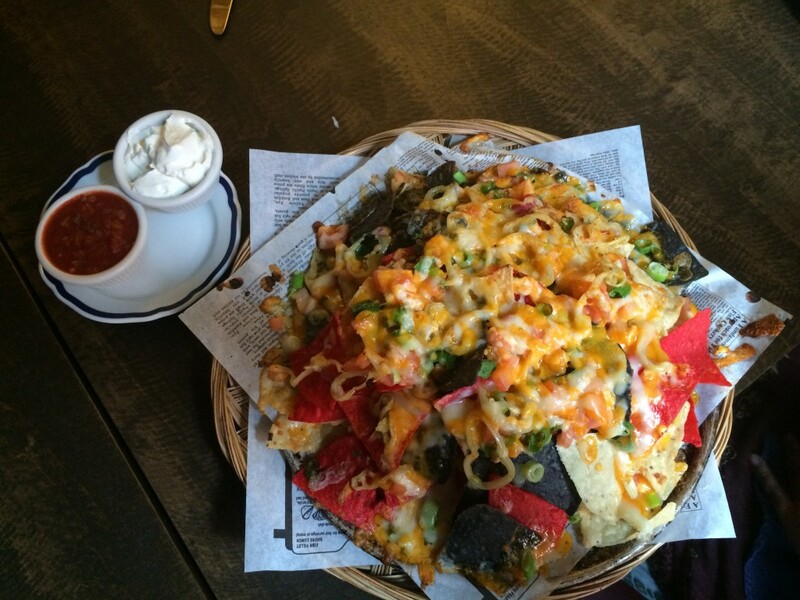 The “Super Nachos” are your basic veggie nachos. They do not come with salsa but “Rosa’s red sauce” is colourfully drizzled around the platter. The single-layer approach enables a “no chip left behind” mentality. 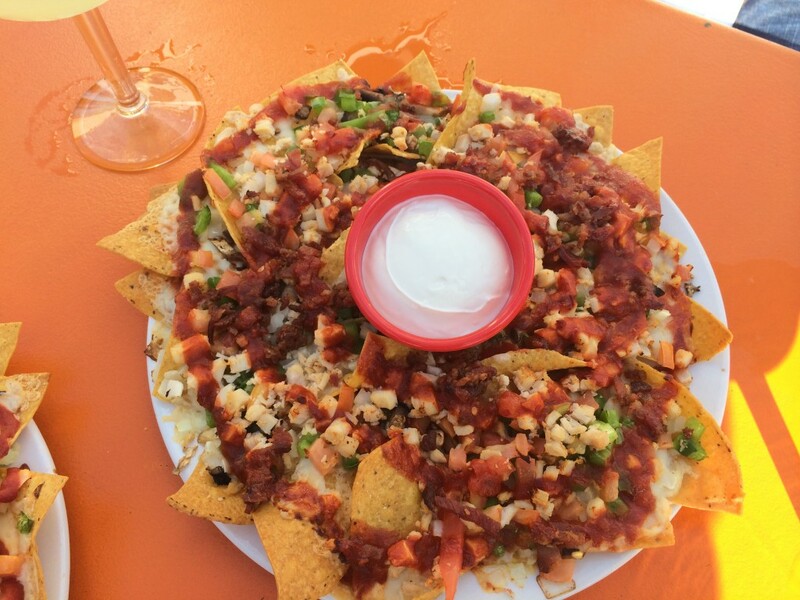 Every chip is carefully and artfully adorned with a perfection of toppings, cheese and sauces. We also wanted to sample something a little more original – something that would showcase what Mexi Cali’s is truly capable of. Michael insisted on the “Chipotle Chicken Nachos” which come with onions, green peppers, mushrooms, tomatoes, bacon (BACON! ), diced chicken and a honey chipotle sauce. Both platters were exceptionally good. Not to mention the guacamole was out of this world! This is the only guacamole worth ordering on Spring Garden Road. Also, you can request a bottle of puréed jalapenos to kick up the heat a little bit. Everything is made in-house and entirely delicious. The only problem is that the platters are quite small – they are truly appetizer sized or an entrée for one. Mexi Cali’s got the highest marks across the board, except for “Perceived Value” and “Size”. I can’t recommend speak for the rest of the food at Mexi’s, but I am down with the roof top patio, the margaritas, the Bulldogs, and the amazing nachos! Rogue’s nachos were my stand-by going into the Quest, and as I predicated, the real crowd pleasers here are the cheese coverage and portion size. The nachos were actually kind of glued down by the cheese, but excavation revealed some empty chips. Despite a few imperfections, Rogue’s still got one of the highest marks for layering and placed #1 for portion size. The flavours were adequate, in virtue of enough cheese and the round salty chips. We also really enjoyed the pulled pork option. Michael says the score for “Flavour Impression” is a 3/5, but the pulled pork is a 4. The guacamole is simple “tube guac”. Not worth it. These nachos aren’t much to look at, but they will feed a group without too many naked chips left at the bottom. The best things about this platter were the chicken and the house-made salsa. Rock Bottom scored second place in the salsa category, trailing only behind Mexi Cali’s. The sour cream also had Michael Dinn’s sour cream stamp of approval. Overall, this is a small lackluster portion, which is too bad because Rock Bottom makes some of the best beer in the city! Mexi Cali Rosa’s nachos are a league above the rest, with their gourmet nachos and home-made dips. Enjoy on the sunny patio with a margarita, Corona or Bulldog. Just keep in mind that the portions are small. The Arms, located in the Lord Nelson Hotel, have a great deal going with a large layered platter of nachos with house-made banana peppers for $13. The redesign is more upscale than the Victory Arms, so expect a slightly less casual environment. 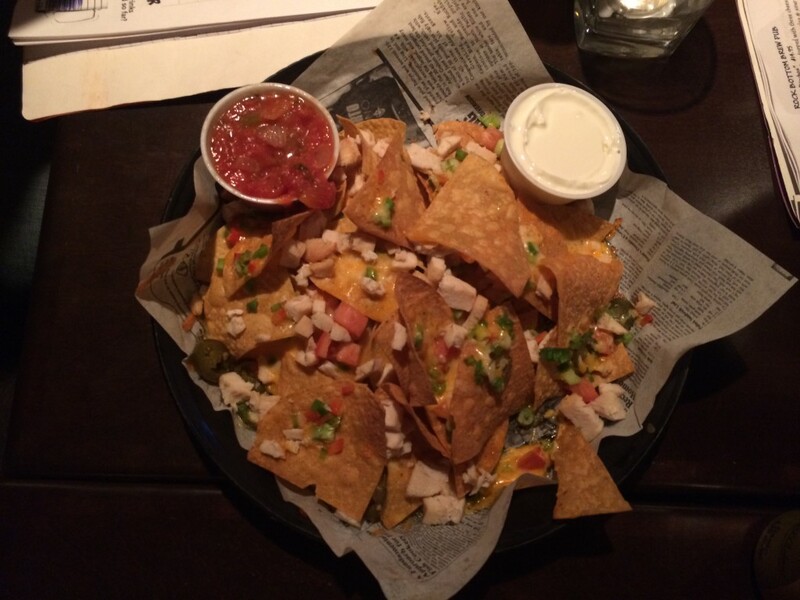 Rogue’s Roost has what Denton describes as “Nachos for the evening”. 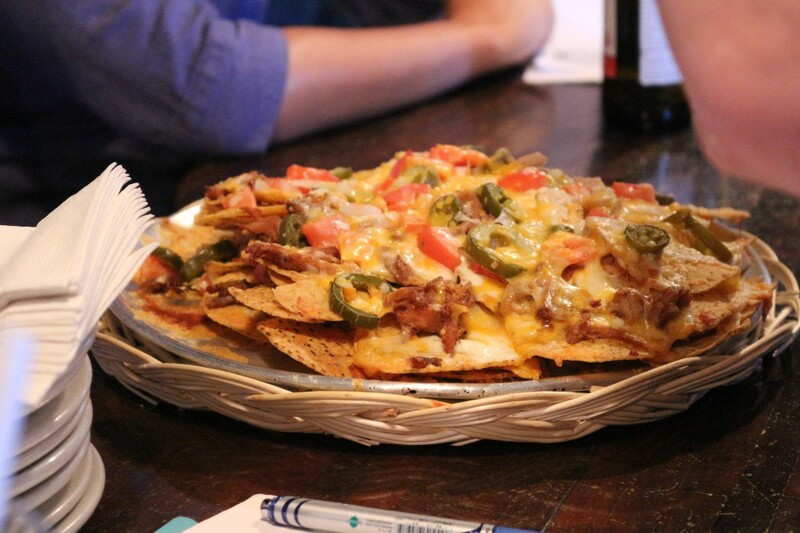 If your party wants to sit down around a big plate of nachos and enjoy some craft beer – this is the place to go. Get the pulled pork. Avoid the guac. Alternatively, The Fickle Frog is “An evening with nachos” – it is no nacho destination, but the nachos are an excellent choice when enjoying a 36oz steiner for $6.50 on Sundays! 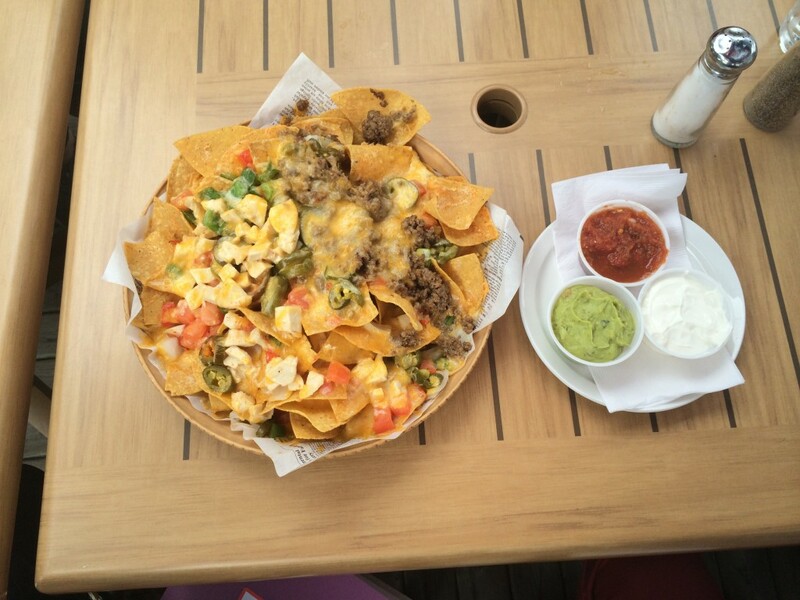 Get the Classic Nachos with beef, or the Tropical Nachos sans protein. 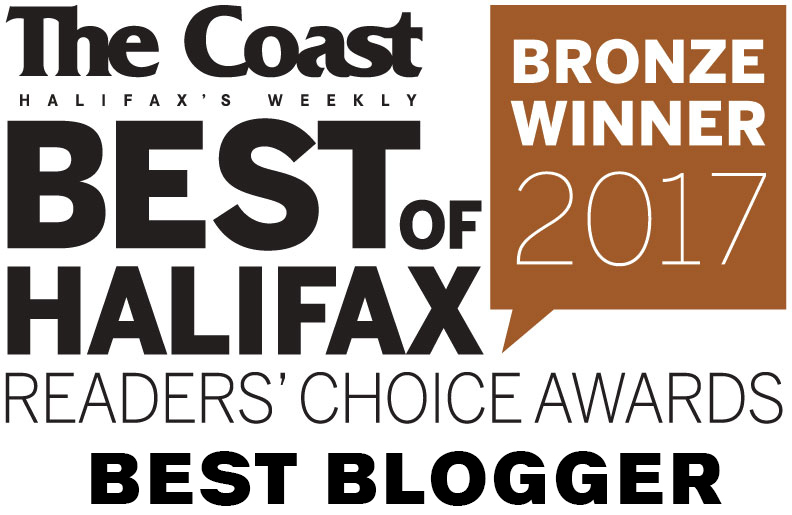 Your Father’s Mustache, generally has the worst food of any place I’ve tried in HRM. We’ve made active efforts to try eating at tons of places since moving here 4 years ago. The ONLY reason that place is open, is because of the patio. LOVE the nacho idea !! 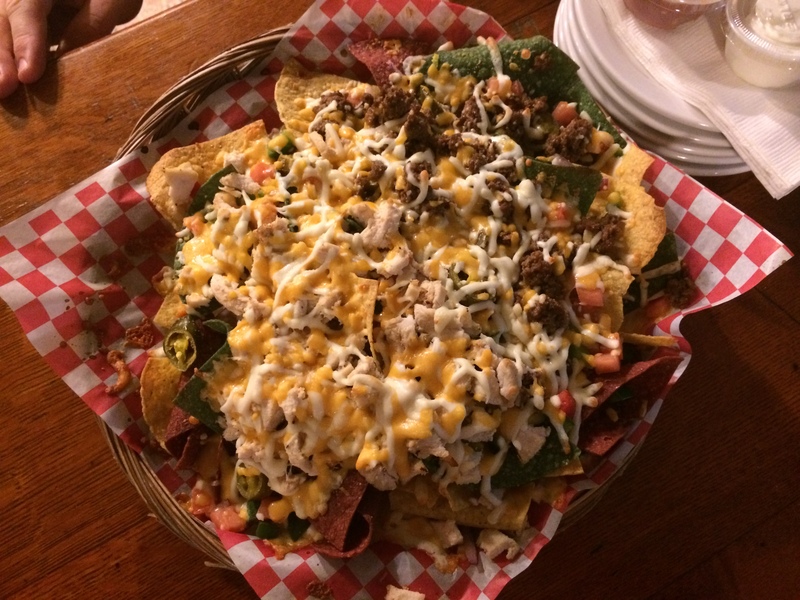 You to check out The Red Stag Tavern’s chicken nachos are the BEST around, hidden gem ! Based on this, tried the Nachos at Mexicali Rosa’s and the are AMAZING. Thank you so so much for this research. It is a new Thursday tradition now.